Centre Nautique, Bonifacio, Corsica. Bar, hotel, apartments, shops. The suite 1, thanks to its high ceiling, its large black window-frames overlooking the marina, its white immaculate walls or even its seats covered with grey woven hessian is kind of photographical. 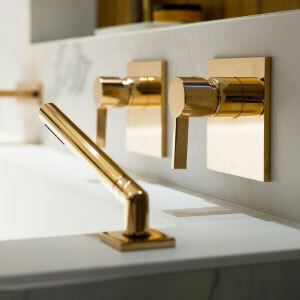 Everything here is luxury and refinement ! The suite can be divided in two areas of the same size by a large grey curtain that separates the bedroom and the bathroom from the sitting room. 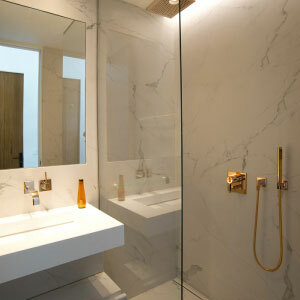 The white marbled floor and bathroom’s furniture’s light this Suite through the ground. The desk, a teak box module, offers a workspace or a reading area, a start for a peaceful traveler’s correspondence. .
Its intimate atmosphere invites the guest to become a writer for an evening or for a week…This suite expects from you that you are well traveled, that you can praise the present moment, that you can chill out being conscious of what is going on outside as well as inside. From the windows overlooking the marina, comfortably seated on your Danish couch, you will either dream of sailing off or enjoy your beautiful haven ! The large textile separation allows to separate this Suite in two parts: lounge side, night side and luxury bathroom. All Suites proposes two bathrooms: one with a large bathtub invites to relax, a second with a shower for the most in hurry. Direct view on the Marina from tow larges windows; a third one offers, through its large flat TV screen, a view towards the world if dreaming elsewhere was needed. 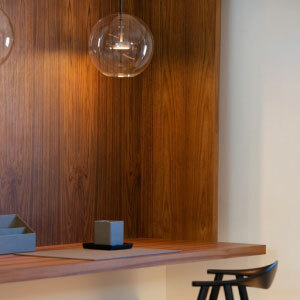 The one wishes to be satisfied of the place with a coffee, could thanks to the kitchen area in each Suite. Each suite has its own lamps. Magali Terzian, our designer, turned each of these four magical numbers into a specific experience. The suite 3 is full of sweetness and smoothness… Nestled under the roof, this suite is bathed in the sweeping and stimulating light of the zenith, playing with the shades of grey, of dyed textiles and deep abyssal blue colours. In a loft spirit, the bathroom standing close to the bed gives the opportunity to enjoy the view on the entire open space. Like in the other 3 suites of the « Centre Nautique », a movable textile wall allows you to divide the space, separating temporarily the sleeping area from the sitting room, adding some privacy to this spatial modernity. Clear and sober at daylight… the backlight of the bed and the furniture’s, the mirror cubes, offer a luxurious shine to this transformist Suite by night. In the alcove desk, adjoining the large bed, it will always be possible to inscribe few lines of a journey. Three is makes travel between soberness daylight and nightlight pleasures. 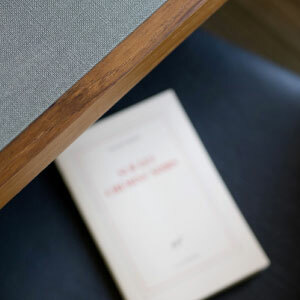 Beige colour, sanded marble, Nordic inspired design… this is the menu for the suite 4 ! Like the suite 3, it is located right underneath the original wooden structure of the roof and is flooded with a generous brightness. The large roof windows pour a smooth light over the bed and the sitting room equally and covers the whole space with a warm sandy colour, such as a Swedish plaid ! At nightfall, the clear blown glass domes lamps offer a delicate light. Like in the three other ones, two to four guests will find here a luxury halt. The traveler will bathe in his Suite or swim on a marvelous beach of South Corsica. No matter, the experience makes the trip, and Suite 4 proposes a relaxing one. On this occasion, the Hotel Centre Nautique offers promotional rates. The bar located on the groundfloor, has been totally redesigned as well, in a sailing spirit, present in materials like brass, teak wood and the unique blownglass ceiling lamps from Murano. The bar is a bright contemporary frame that seems ready for a long-distance journey, with a touch of trendy vintage ! The Roof Top bar offers a breathtaking view over the marina and the citadel of Bonifacio.Entertainment, theme parties or privatization of the space… everything is possible !Designed in a lounge spirit, this area fits wonderfully in the « Carré d’Or ».The Roof Top bar is the best relaxing stop !!! The Fedeli tradition brand is now in its third generation of leaders. 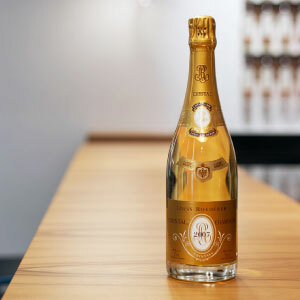 Since 1934, it has been synonymous with the harmony between high quality materials and excellent confection. Gentlemen, they have of course thought of you, the hairdresser & barber service is made for you. In the furthest south of Corsica, in Bonifacio, the « centre nautique » hotel renewes its look.Of the old harbour master’s office only the large stone walls remain. The building, redesigned by architect Alexandra Lanfranchi and interior designer Magali Terzian, stretches for more than 1000m². Within it a hotel still works proposing its customers 4 large deluxe suites, offering a privileged and comfortable stay. Le Centre Nautique offers a new panorama over Bonifacio’s Marina. It has become the first French destination as pleasure and luxury.On the first floor, on the large terrace, the lounge rooftop bar gives a perfect view on the Marina, the Yachts and the Citadel. By day severals top line boutics allows anytime shopping, with the new collections from ERES & FEDELI. 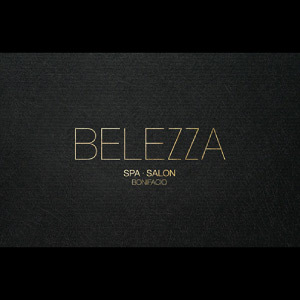 Artistic discovery by visiting UP GALLERY, or even a well-being or hairdressing moment at the BELEZZA SPA SALON… Even Mister could cut his beard. 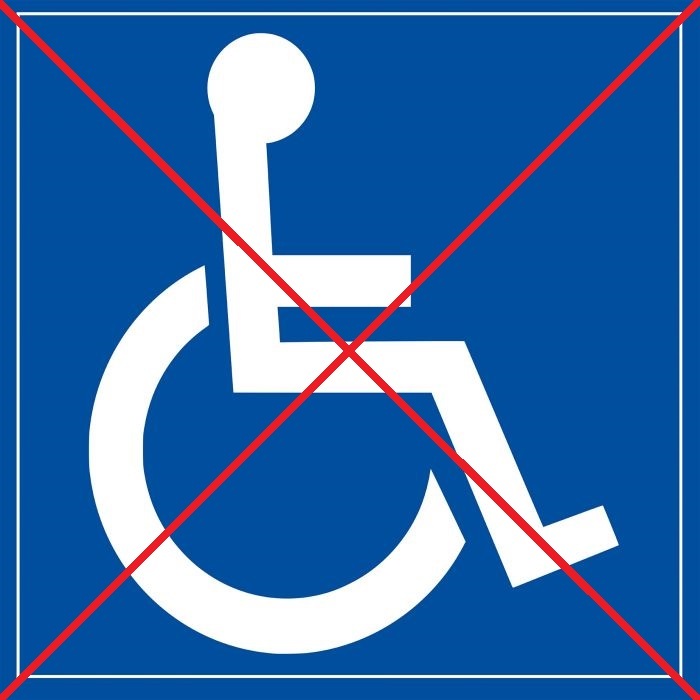 Establishment not able to receive people with reduced mobility.